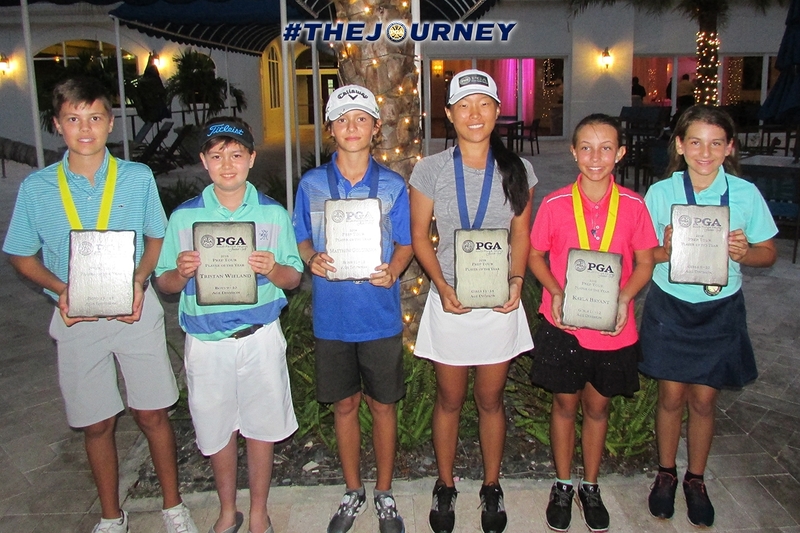 November 6th 2018 - ATLANTIS, Fla. – The South Florida PGA Junior Tour named eight Player of The Year winners for each division last weekend. The South Florida PGA annually awards Player of the Year honors in the Prep Tour Girls and Boys 9-10 age division, 11-12 age division and 13-18 age division. Palm City native Abigail Halpern and Laney Ryan of Vero Beach have been named the 2018 Prep Tour Girls 9-10 Player of the Year winners. Halpern began her journey in the South Florida PGA Team Golf program and has progressed this year capturing three Prep Tour titles this year. Halpern looks to continue her progress through the journey and move onto the Challenge Tour in 2019. Ryan, new to the South Florida PGA Junior Tour this year, participated in four events where she captured the title in one event and had two runner-up finishes this season. At age 9, Ryan looks to continue her journey in the Prep Tour in 2019. Kayla Bryant of Boca Raton has been named the 2018 Prep Tour Girls 11-12 Player of the Year winner. Bryant, a South Florida PGA Junior Tour member for two years, has captured back to back Player of the Year titles on the Prep Tour. The 11 year old took home the 2017 Prep Tour Girls 9-10 Player of the Year title and won eight events on this year’s Prep Tour. Bryant will continue her journey as moves up to the Challenge Tour in 2019. Jupiter native Theodora Scott and Cynthia Liu of Parkland have been named 2018 Prep Tour Girls 13-18 Player of the Year winners. Scott began her journey with the South Florida PGA Prep Tour in 2017 and has progressed rapidly, dropping her scoring average by seven strokes. Liu, new to the South Florida PGA Junior Tour this year, participated in eight events. The 13 year old exceled in the Prep Tour this year and recently moved onto the Challenge Tour. Tristan Wieland of Jupiter has been named the 2018 Prep Tour Boys 9-10 Player of the Year winner. Wieland, a member of the South Florida PGA Prep Tour since the inaugural year in 2016, has grown and developed tremendously through his journey. The recently turned 11 year old, captured victory in seven of his eleven starts this season. Boca Raton native Matthew Golovanov has been named the 2018 Prep Tour Boys 11-12 Player of the Year winner. Golovanov was seven for seven this year as he captured every Prep Tour event title that he participated in. Golovanov looks to continue his journey through the South Florida PGA Programs after three year on the Prep Tour by making the jump to the Challenge Tour in 2019. Davis Dickinson of Palm Beach Gardens has been named the 2018 Prep Tour Boys 13-18 Player of the Year winner. Dickison began his journey in the South Florida PGA Team Golf program, progressed through to the Prep Tour and now looks to finish out the 2018 season on the Challenge Tour. The 14 year old progressed rapidly over the year, participating in eleven of our twelve events hosted. We congratulate all of these individuals on their outstanding performance. The South Florida PGA Junior Prep Tour presented by The Honda Classic is a membership-based tour open to boys and girls ages 9-18 in South Florida with the aspirations and skill levels to compete at the High School level and features some of South Florida's most talented junior golfers. The Junior Prep Tour offers twelve one day championship events for junior golfers in South Florida. The South Florida PGA Junior Prep Tour is proudly presented by The Honda Classic and supported by Don Law Golf Academy, Florida Institute of Performance, Junior.Golf, Palm Beach County Sports Commission, Precision Pro Golf, Pukka, SACSN, and The Men’s Fun Group at Mirasol. The South Florida PGA Junior Prep Tour, run under the South Florida PGA Foundation, is committed to its mission of keeping membership and tournament-related costs low while providing first-class quality golf at ten championship courses throughout South Florida over the course of the entire Junior Prep Tour season.